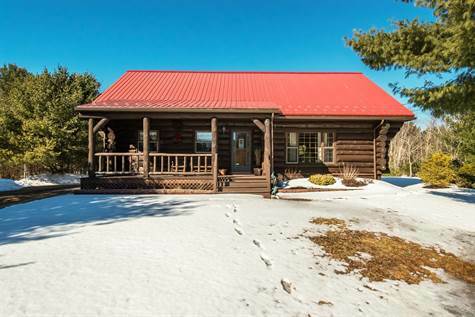 Open concept yet cozy log home is 1800 + sq ft with floor to ceiling fireplace. Nestled down a tree lined drive, you have the privacy of country living on 1.12 acres, yet the convenience of being within minutes of the amenities of Berwick and 15 minutes to both CFB Greenwood and Kentville. Custom built by Heartwood Log Homes is has a steel roof and front and back decks. Eat in kitchen and living room, 3 bedrooms and a 4 pc bath with corner air jet tub, make up the main floor layout. Upstairs, is 400+ sq ft to use as family room or master bedroom with outdoor balcony. Unfinished walkout basement has ton of potential. Currently, has 3 pc bath in the laundry room, sauna, pantry. Lots of storage, utility room, work room and large room with rec room or bedroom potential with window enlargement. Outside is a storage building, with an enclosed fence, a deck area that once housed an above ground pool. Well cared for yard has raspberry and blueberry bushes. Oil tank is 2017.Taxes are 2526.38 for 2018. NS power averages $250 every 2 months.